Medal : Yes, my biggest one to date! A little delayed in writing this, but there has been a little bit of laptop hogging in the Mackay household of late… but here we go. A week (and another half marathon!) later, I am still on a post marathon high. Mainly because a few years ago, after I completed my first half marathon, my knees were in so much pain I vowed I would never run anything more than a 10k again as I just wasn’t built to run. Well I guess something eventually clicked and I realised that with a little more effort, maybe I could run distances. 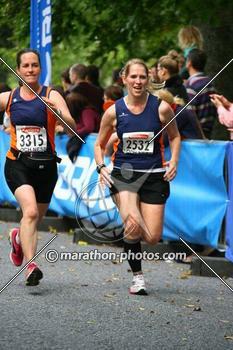 And here I am, 6 half marathons and a few too many 10k’s later… and I have comfortably (I use the term VERY loosely!) completed a marathon. Since I joined The Wee County Harriers, my training has really stepped up a gear. Long weekend runs used to be a tedious affair, on my own with my music. But since I joined the club, I get to talk nonsense at weekends and the miles fly by. What a difference it makes, and what a lovely bunch they are…. Anyway, I digress. Last Saturday we set off for Inverness mid afternoon, got to our B&B, checked in and then headed over to pick up our race numbers for the big event the next day. At this point the reality of it still hadn’t set in. I was about to push my body to do the biggest racing event of my life so far, I was going to have to run for hours and hours and hours, and here I was skipping about Bught Park not giving it a second thought. And that’s when it finally kicked in that I was about to run a marathon. Something I had laughed at the thought of a few years earlier and something I swore I would never do. Oh well, here goes nothing! 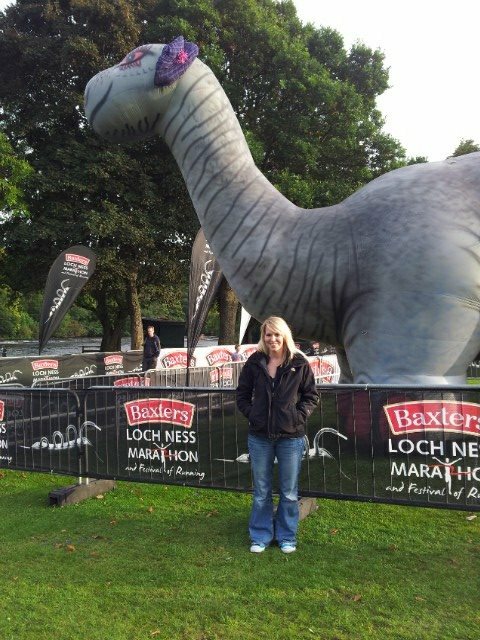 All checked in and ready to go, secretly wishing Nessie would emerge and tow me to the finish line! After dinner we headed back to our B&B and I got all my kit ready for the next day, pinned on my race number and made sure I had everything I needed in my race belt. I’d had a look at the weather and thought although it looked dry I didn’t trust it, so decided to wear two vests – one as a base layer and also to stop my race belt chaffing, and then my club vest on top. My body was physically shattered, but I just couldnt switch my brain off and I was over thinking everything. As Craig dozed off into a relaxed slumber, I lay staring at the ceiling of our tiny B&B room and tried to fall asleep watching the T.V. I think I got a bit of sleep between 11pm and 1am and then from there until 5.30am it was a case of dozing for a bit on and off until I snapped fully awake, gave up and got out of bed just before my alarm. I was up way before the B&B started serving breakfast, but the land lady had said the previous day she would leave out cereal and fruit for us. I wasn’t sure at what point the milk had been left out, but the thought of room temperature milk did nothing for my already depleted appetite, so luckily I had brought along my own porridge pots and some flapjacks which I had along with a couple of coffees. By 6.45am I was ready to go, so I got my stuff together, put on my throw away top which I had bought the previous day and headed down to the buses to meet up with the rest of the crew. The sun was just coming up as I walked over to the park and the roads were empty and quiet apart from a steady stream of runners, appearing from hotels all the way along the river. Jemma was already at the park and I met up with my brother in law Stuart (who was also running his first marathon), had a quick dash to the loos and made our way to one of the many coaches which would be our mode of transport down to the bottom of Loch Ness to our race start destination. The coaches starting moving bang on 7.15am, so we eventually found our way to a double decker and within a few minutes we were off! This was it, no other way back now! The majority of the journey flew by, but once I realised how far we were actually going, nerves set in again and I was suddenly desperate for the loo. Unfortunately the last part of the bus journey is all up hill and the coaches slowed down to a crawl at this point. Getting to our destination was a very welcome sight! Pre race. Nervous about what I am about to ask my body to do, but excited all the same! The queues for the toilets were ridiculous. The queue was coming from both directions and people were skipping it all over the place. I guess there’s only so much you can do for 3000+ people who all the need the loo at the same time though! The countdown had now begun and we decided there was nothing left to do, no more we could do, but head to the start line and await our fate. This was finally it. What I had thought I would never manage. I saw a few club members, wished them luck and then bang on 10am we were off. The course elevation. Didn’t realise how high we had started until I looked at this! That hill came out of nowhere and was steep! I pushed right to the top and then enjoyed the next few miles of gentle ups and downs and felt positive and strong as I fuelled myself with powerade and shot blocks. One of the things I really loved about this event was the amount of support. Not just from people standing along side the roads and through villages, but the runners themselves. 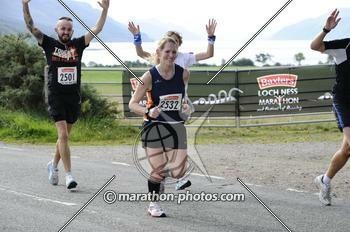 Random people passed me and cheered me on, giving me a little boost every now and again and it was just fab! I felt great until about 16.5 miles (I think) coming into Dores. I took a bottle of water and realised it didn’t have a lid, so I walked to take a proper drink and then just couldn’t seem to get my speed back up. I knew the hill was coming up soon so I tried to push on a bit further, but something in my leg started to ache. I tried to ignore it and got chatting to a lady as we started the plod up the hill, but it just kept burning away. I decided not to push it with so far still to go and walk the hill thinking the downhill section at the other side would help the pain. But no, it hurt even more. 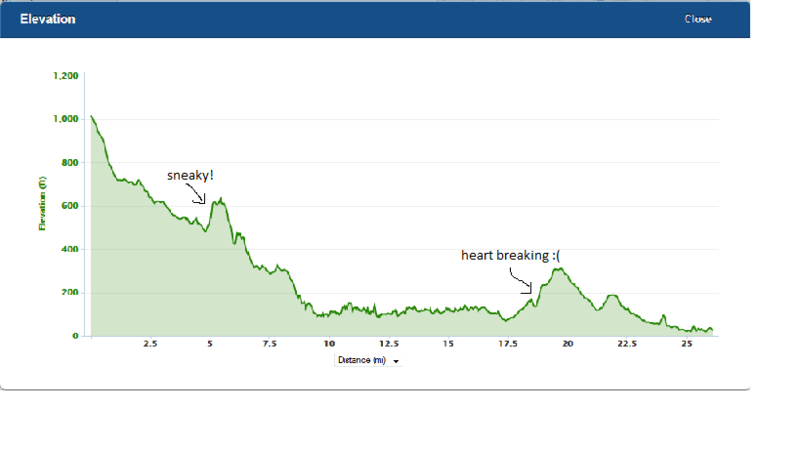 So from there I saw my 4 hour goal time slip slowly out of sight (up til now I had been on course for a comfortable sub 4 time, but this hill had seen an end to that!). I hobbled on, half running-half walking and then was caught up by two runners from my club, Susan and Catriona. Susan was running really well and as she passed me she said Catriona wasn’t far behind. I ran with Catriona for a bit, hoping the pain would subside and I could get my focus back, but it was useless. I had to drop back to a hobble again and let them slip out of my sight over the hills. This stupid pain was not going to end my race though, I had worked too hard and for too long to give in. So after forcing down another gel and some water I pushed on for the final undulating stretch of the race. Sub 4:30 was still in sight and that was what I was aiming for – nothing left to do but move these legs for the final 5 miles. Coming back into Inverness the crowds started to grow and grow. This was just awesome. Big groups of charity supporters were standing either side of the road with foam hands and plastic horns and they were cheering everyone on. It was just fantastic! I pushed on and on and suddenly a lady passed me who I had seen much earlier in the race. We had been playing a game of cat and mouse for 4 or 5 miles and eventually she got away from me in Dores, and she said “come on Wee County, not far to go!”. How lovely. That really helped at this stage and I knew I would be able to run the final few miles, no matter how much my body wanted to shut down. Coming down along beside the river, you can see and hear the finish line on the other side. I was tempted to jump in and swim across, but I knew that wasn’t an option so I kept plodding round only to spot Karen and Claire from the club who had earlier completed the 10k. Their cheers and support definitely helped in that last mile and a bit and before I knew it, I was on the other side of the river looking back at the other runners making their way around and probably thinking my exact thought not 10 minutes previous. I could see the finish line and hear all the names being shouted out as the crossed it and from somewhere, I have no idea where yet, managed a proper run once again. I spotted Catriona walking just before the park, hung back for her and together we managed not only a sprint finish, but a SMILING sprint finish!! Where’d that smile come from? And that was it. I had completed my first marathon! I felt a rush of pride, excitement and possibly slight nausea as I collected my beautiful medal and goodies, including Baxters soup (of course! ), an awesome race t-shirt and lots of food! 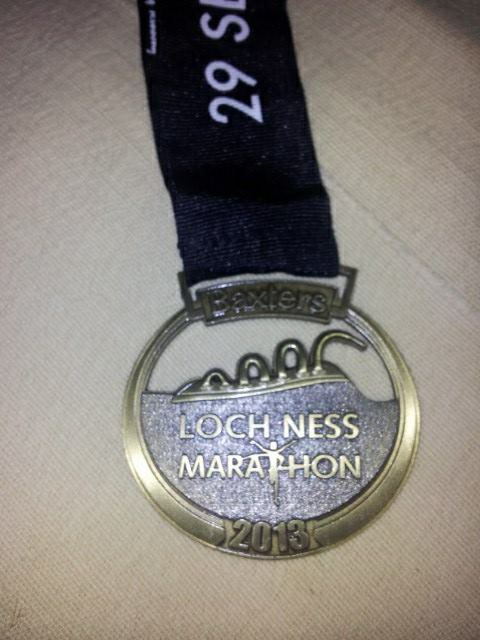 It wasn’t quite the time I’d had in mind, but for my first marathon I was elated. I’d finished it smiling and that was enough for me! 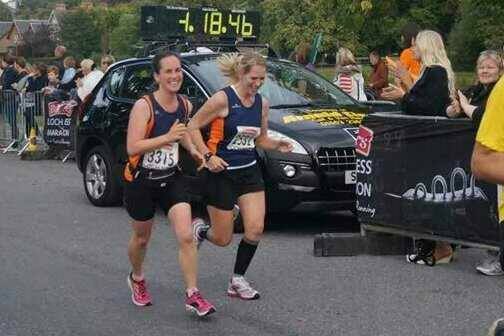 After a good stretch and some fluids, we were back in the car on our way home, sleepy, happy and a marathon runner. And now for the Ultra….. 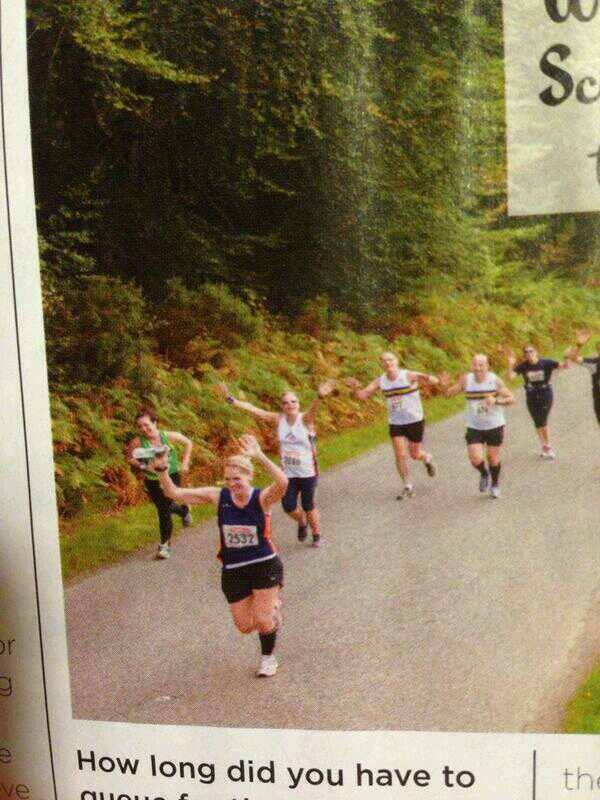 I even made Women’s Running magazine with my thumbs up pose en route. Famous!! 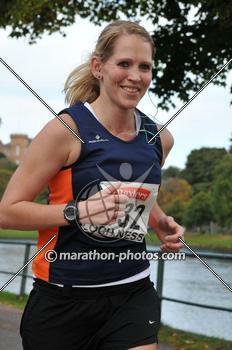 I love your smiling finishing pictures! 1st marathons rarely work out as planned; most people end up discovering that their bodies don’t respond quite as they expect after 20 miles of racing (as opposed to running). 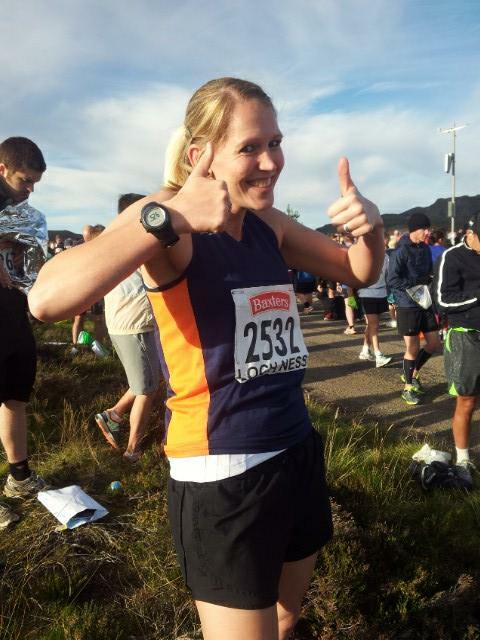 Huge well done to you – sub4 will come soon! Awesome result Iona! 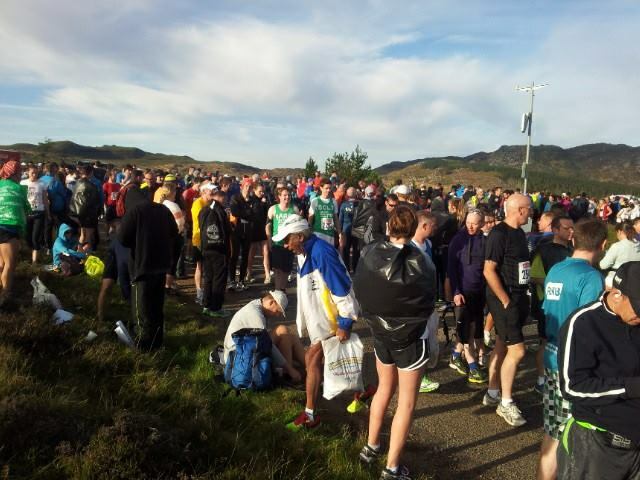 Well done on your first marathon- has the bug bitten you? Are you signed up for the next? Thank you!! Yes well and truly bitten. Got my first ultra in November and I’m already signed up for Strathearn and possibly Lochaber next year. I’ve gone a bit daft this year it seems! !